Pocket Tunes has long been the most popular audio player on the Palm OS, and the recent update to version 4 has produced a raft of cool new features including an Internet Radio Catalogue, a swanky new interface and album cover art support. Loading up the application, the sleek dark blue graphics immediately impressed, offering a smooth, shiny, Vista-like interface. Album art could now be seen on the main screen and clicking on the small image (or pressing 'w' on the keyboard) brought up a full screen version, albeit a tad pixellated. Running along the top of the screen are current time and battery info, with access to the drop down prefs and options menus (more about them later). Underneath is the song information area, displaying the track's artwork, title, artist and album name. A large, animated, two-tone horizontal bar keeps the user informed of the played/total time of the current track, with the option to tap or drag forwards or backwards through a song. 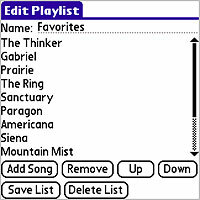 A window below displays five songs from the current playlist (six if you reduce the default font from small to positively teensy weensy), while bashing 'l' on the keyboard gives speedy access to the playlist manager. Sitting below the track listing are tappable controls for shuffle & repeat and a draggable volume display bar with percentage readout. Finally, a large row of five buttons at the bottom of the interface lets you rewind, play/pause and fast forward through your selections, either by clicking onscreen or by using the Palm's hardware buttons. The final button is perhaps the most interesting, launching the Internet Radio manager, which offers a pre-installed catalogue of Shoutcast stations (previous versions required users to input station URLs in manually). There's a fairly comprehensive list available, although it has something of an American bias and, sadly, nothing from the good ol'BBC (the Beeb doesn't provide the necessary aacPlus or MP3 streams). Tuning into a station is a bit of revelation; even though we were connecting via a bog standard GPRS connection, the sound quality was generally excellent, with no stuttering. We weren't able to connect to all of the stations on the list however, but it was fun tuning into a Hawaiian radio station while looking out into the London gloom. Of course, you're going to need a very generous GPRS data allowance if you intend to use the radio frequently, so check with your network provider before settling into that four hour Icelandic folk remix. 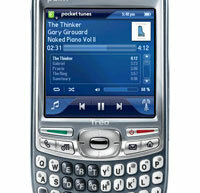 As with MP3s we had no problems listening to radio streams in the background while we used the Treo for sending off emails and editing a Word document, although the phone was occasionally a tad sluggish when switching between apps. The application handled phone calls well too - if we received a call, the stream would pause and then reconnect after the call had ended. Another nice feature is the mini MP3 player that can be called up when you're using other applications and playing songs in the background. This pops up on the lower half of the screen and gives quick access to song controls, so you can skip songs without having to open up the full program. The player can handle all the major file formats like MP3, WMA, AAC, aacPlus, Ogg Vorbis, and WAV, with the deluxe version supporting PlaysForSure and DRM-protected content (but not iTunes files). When hooked up to a PC, Pocket Tunes appears as a regular MTP (Media Transfer Protocol) media player and can then sync music, playlists and podcasts with any compatible desktop software. Although we had no problem syncing over files, we preferred to make the job quicker by slamming the SD card into a media reader and transferring the files over that way. Once the music is loaded up on your Palm, the program shuffles through the list and categorises the content into Artist, Album, Title and Genre sub-categories. Although the makers Normsoft are making a bit of a hoo-ha about the improved audio quality in the new version, we were hard pressed to notice any big difference. Maybe if we got out our Grado S60s it would become apparent, but seeing as Version 3 sounded good and, err, Version 4 sounds good too, we're not complaining. The 5-band graphic equaliser definitely seemed an improvement on the previous version though, as that seemed apt to distort when you tried to introduce Phil Spector-esque soundscapes. For some, the simple Bass Boost button might be enough. There's also support for cross-fading across variable bitrate tracks, if that's your bag, with optional plug-ins adding expansion possibilities. As with previous versions, Pocket Tunes comes with a wealth of options to customise the program to your tastes. The program comes with a skinnable interface, with lots of mighty purdy free skins available from third party sites as well as Normsoft's own site. The skins can be moved to the memory card too, which is a good thing as the lardy 1.8 meg Pocket Tunes application will take a fair chunk of your Palm's memory. "We still do not recommend running Pocket Tunes from a SD card because you cannot launch a stream from Blazer (system limitation), however this is less problematic in 4.0 because it has a built-in Internet radio catalog, no longer requiring the user to use Blazer. There is still an issue with Pocket Tunes sometimes being left in internal memory when running from a SD card. Some customers have found that PowerRun helps to prevent this from occurring." 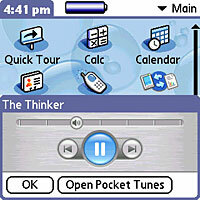 Sporting a smart and modern interface and a wealth of new features, this latest version of Pocket Tunes truly is a must-have application for music fans using the Palm OS. Audio Support: MP3 (all bitrates, CBR and VBR), AAC (all bitrates), WMA, Protected WMA (PD-DRM WMDRM9, Janus WMDRM10), aacPlus/HE-AAC v1, aacPlus/HE-AAC v2, Ogg Vorbis, PCM WAV. Playlist Support: Stored on SD card: M3U, PLS. 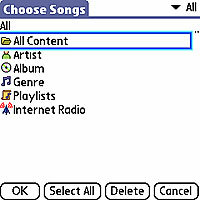 Stored on device: internal playlist format. Accessed via HTTP: M3U, PLS. Other capabilities: playlists that include other playlists are expanded automatically. Streaming Audio: Protocols: HTTP, ShoutCast, Live365. Formats: MP3, aacPlus, Ogg Vorbis, WAV. Album art: JPEG format any size (depending on available memory).